A piston is that part of an internal combustion engine or air compressor which requires producing the work done. If you are from mechanical or automobile engineering side then you might know the importance of this important part. Piston forms a guide and bearing for the small end of connecting rod and also transmits the force of the explosion in the cylinder, to the crankshaft through connecting rod. Here I will like to share the information on the piston of I. C. Engine. So, the concerned person from design section will get benefited. 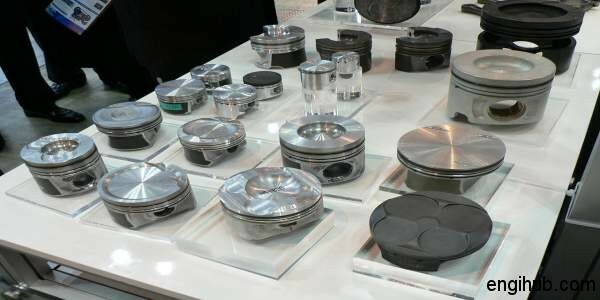 The top of the piston is known by many names such as a crown, head or ceiling. This is thicker than the bottom portion. The bottom portion is known as a skirt. There are grooves made to accommodate the compression rings and oil rings. The groove, made for oil ring, is wider and deeper than the grooves made for compression ring. The oil ring scraps the excess oil which flows into the interior through the oil return holes and thus avoiding reaching the combustion chamber but helps to lubricate the gudgeon pin to some extent. In some designs, the oil ring is provided below the gudgeon pin boss. The space between the grooves is called as lands. The diameter is always kept smaller than that of the cylinder because the piston reaches a temperature higher than cylinder wall and expands during engine operation. The space between the cylinder walls and pistons is known as piston clearance. The diameter of the crown is slightly less than at the skirt due to variation in the operating temperatures. Again the skirt itself is also slightly tapered to allow for unequal expansion due to the temperature difference. As you move vertically along the skirt the working temperature is not uniform but slightly decrease. So, Which Material Is Most Suitable For Piston? Cast Iron, Aluminum Alloy and Cast Steel etc. are the common materials used for pistons of an Internal Combustion Engine. Cast Iron pistons are not suitable for high-speed engines due to its more weight. These pistons have greater strength and resistance to wear. The aluminium alloy pistons are lighter in weight and enable much lower running temperatures due to its higher thermal conductivity. The coefficient of expansion of this type of pistons is about 20% less than that of the pure aluminium pistons. But higher than that of cast iron pistons and cylinder wall. To avoid seizure because of higher expansion than cylinder wall, more piston clearance required to be provided. It results in piston slap after the engine is started. But still warming up and tends to separate the crown from the skirt of the piston. Cutting a vertical slot will avoid this disadvantage. This slot helps in taking up thermal expansion. So, the overall diameter of the piston is not required to be so reduced. As to obstruct the safe operation of the cylinder walls and the pistons. To increase the life of grooves and to reduce the wear, ferrous metal rings are inserted in the grooves.